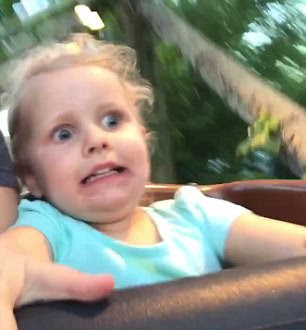 This adorable three-year-old is riding a roller coaster for the first time. If you watch the clip you will see that she has been coached to scream and raise her hands in the air. She complies with this, but her facial expression tells a different story. Throughout the ride she goes back and forth between hands in the air and a tight grip on the bar in front of her. As she is dives into discomfort she learns something new. She learns she likes roller coasters. She learns she can do something scary and difficult. She learns to trust the adults in her life. It is experiences like these that help children to develop a strong sense of confidence that helps them to be resilient problem-solvers. I am not saying that all children need to experience scary rides and amusement parks. But, I am saying that children need to experience being uncomfortable, or sad, or frustrated. They need to learn that they can get through bad feelings and learn something new. If we protect children from disappointments or frustrations we are simply making the path smooth for them. We are NOT doing them any favors. We are NOT teaching them to be confident successful learners. In fact, we are doing just the opposite by creating anxious, unmotivated individuals. How can a child know he is capable if he has never been tested? How can a child know she is capable if she has never had the opportunity to suffer the consequences of a mistake? A smooth path does not grow resilience. It simply creates more problems as children become depended on others to fix things. Let your children experience the natural consequences of their mistakes. Let them dive into that discomfort and learn they can come out stronger at the other side. And all the time remind them that God loves them, no matter what; that Jesus died so they are forgiven; that the Spirit lives and works good in their lives. When you find yourself tempted to smooth the path for your children, instead take their hand and show them how God helps them to overcome sadness, disappointment, anger, fear, and frustration. That is discomfort that results in resilience.